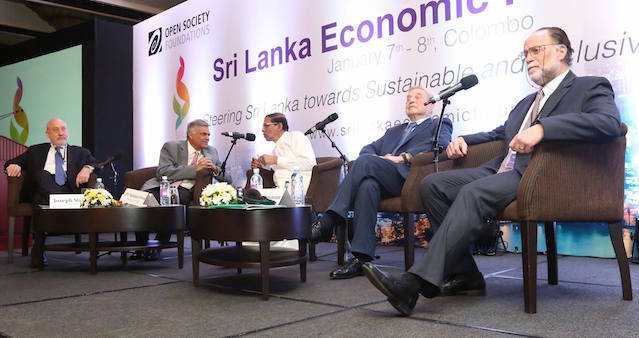 The Friday Forum has underscored that no amount of goodwill on the part of the international community will help Sri Lanka’s economy without discipline and the domestic will to reform. The Forum, comprising of a group dedicated to democracy, good governance, human rights and rule of law said that it recognizes the extremely difficult economic policy choices that our society and government have to make in the present circumstances. “These circumstances include total expenditure in excess of incomes earned in the economy requiring borrowing abroad year after year; a continued failure to raise government revenue adequate to meet government expenditure; a rampant rise in government expenditure pushed by competitive populist measures espoused by the main political parties at elections; the consequent recourse by government to debt financing, borrowing in both domestic and foreign markets to pay for rising expenditure and servicing accumulated debt of government absorbing a large and rising proportion of government receipts; and denying resources to undertake both rising current expenditure and to continue with current investment projects, leave aside new investments. The rupee cost of servicing foreign debt rises with the devaluation of the rupee and worsens domestic public finance problems,” the Forum said in a statement released on Thursday. The international economic conditions now and in the near years not holding prospects of rapid growth in the principal economies of the world as in the previous decade or so, to enable the Sri Lanka economy to grow faster pulled by export demand. “It is probable that interest rates in world capital markets may rise after several years of very cheap money and that rise will make refinancing of government foreign debt far more expensive. Remittances from earnings overseas by Sri Lanka nationals did not rise in 2015 and that may worsen the problem in the balance of international payments. Slow growth in the economy enforced by these circumstances will reduce the increase in living standards and cut own growth in employment opportunities. It is imperative that whatever mix of policies is chosen, that mix includes measures to minimize adverse effects on those least able to bear them. To make an understatement, these are unpleasant situations for any government to handle,” the statement said. According to the Friday Forum, Sri Lanka has a small number of options to choose from, which are however not easy to implement. “The temporarily pleasant choice is to go on regardless and finance increased government expenditure by printing money and extending credit to the private sector on easy terms to expand private expenditure in the hope of growing out of economic difficulties. It is as temporarily pleasant as it is in the longer run impracticable. Boosting domestic demand in that manner will soon create a crisis in international payments, raise domestic prices rapidly, depreciate the rupee against all currencies and lead to other nasty consequences, which have the potential to destabilize society, both economically and politically,” the statement signed by Dr. G. Usvatte- Aratchi and Prof. Savitri Goonesekera said. The other choices are likely to cause hardship in the short term but may bring back stability to the economy and given wise policies to a long term growth path. Hardship will come because easing the severity of current crises in the economy will require restraining the growth of total domestic demand bringing down rates of growth, with little expansion in export demand. “Government will need to review seriously incentive structures and institute fundamental reforms in government finance and administration,” the statement said. The Forum noted that the Central Bank has the responsibility to bring the financial system to sound health. The severity of hardships can be mitigated, but by no means eliminated, with the help of the international community whose good will to the people of Sri Lanka has been high since January 2015. “However, no amount of goodwill on the part of the international community will help the economy without discipline and the domestic will to reform,” the group said. “Further there is the possibility of direct controls on imports and capital movements. We are all too familiar with the consequences of these controls from experience in the 1970s. Discretion to allocate resources in the hands of politicians and bureaucrats will corrupt whatever is left of a working government machinery. In so doing we also would infringe international agreements which we had entered into. All assistance from intergovernmental financial institutes will come under serious questioning. Private net capital inflows would most likely dwindle at best to a trickle,” the statement said. According to Friday Forum, whether we can muster the will to make any of these options depends on the public and government appreciating the severity of the crises and the dire need for corrective action and for taking difficult decisions, therefore the Forum invited universities, institutions providing higher professional training, research institutes, civil society organisations and competent individuals to make every effort to inform the public of the nature of the problems and the consequences of leaving the crises unattended as well as those that follow from adopting alternative corrective measures. Friday Forum also requested all media, print and electronic, to provide space in which these alternatives can be discussed widely and in depth.